Today is the final day of Volunteers’ Week, and I thought I’d take the opportunity to write the final blog post of the series. All week we’ve been saying an emphatic THANK YOU to every single person who has offered their time and expertise over the past year to UCL’s SCAR department, and asking them to write a guest blog post to showcase some of the incredible skills and expertise they’ve offered to a range of different projects. 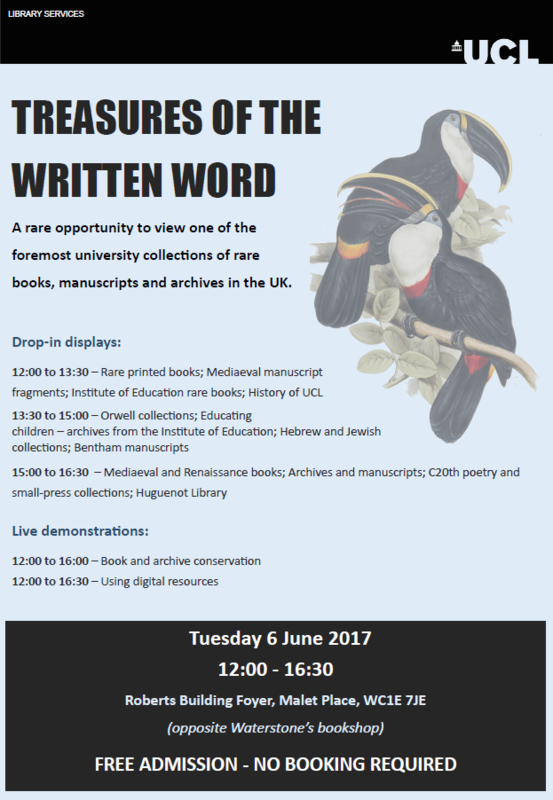 As part of UCL’s Festival of Culture SCAR put on an annual event; Treasures of the Written Word. 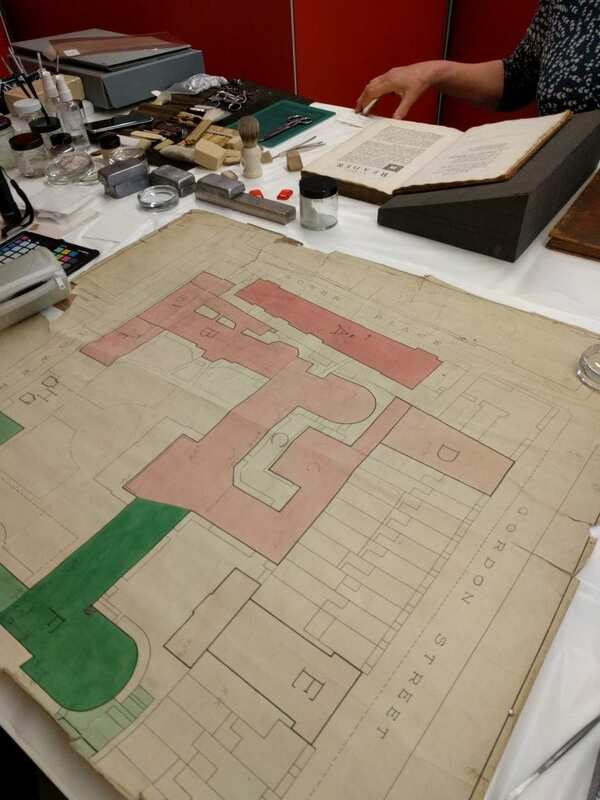 UCL staff, students and members of the public were invited to view some of the department’s most intriguing and precious items and learn about them from the department’s experts. Volunteers helped to welcome guests, keep record of numbers, explain details about some of our collection items (especially if they had been volunteering on projects with which the items related) and generally make the event run smoothly. We were a well oiled team and despite the abysmal weather the mood was upbeat and the event went without a single hitch. Thank you so much to all that gave their time to help out, it was hugely appreciated. The Volunteers’ Week blogs were meant to be a way of saying thank you to volunteers rather than a way of finding new volunteers – but it looks like we might have found some new recruits from our readers as well! This is wonderful and is a real testament to the power of volunteers’ enthusiasm for the roles they carry out at SCAR. As the academic year comes to a close we will be saying goodbye to many of our student volunteers, who will be travelling home to families or simply taking a well earned break. We hope as many as possible return to us in the Autumn to continue as volunteers, but for those who are moving on to new places of study or work (or new volunteer placements elsewhere) we’d like to say thank you. It’s been a real pleasure having you spend time with the department and you can rest assured that the projects you’ve helped us with have benefited immeasurably from your involvement. We will also be developing some new volunteer roles that will start over the Summer holidays, as this is also the season when some people have more time to offer. UCL Records department, for example (pictured at the Treasures of the Written Word event above) will be looking for people to help with a project to better store and keep historic student records and there might be new opportunities to volunteer with our Poetry Store and Little Magazines collections (these are still in the pipeline!). So watch this space for updates from new volunteers and projects – we can’t wait to see what the future holds!